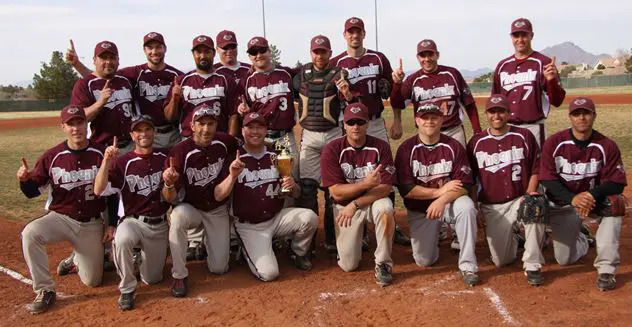 LAS VEGAS – Kirk Jacobs had four hits and three RBI, and Freddy Flores pitched a complete game three hitter with eight strikeouts as the Phoenix Tube defeated the Montebello Angels 8-1 to win the Kickoff Classic 35-and-over title. Tied 1-1 in the top of the fifth inning, the Tube exploded for five runs to build a 6-1 lead. Jacobs stroked a two-run single, Mike Arranzullo added an RBI single, and ex-majaor leaguer Pete Schourek ripped a two-run double to complete the rally. The title game jackpot was the first in six trips for the Tube. “This was great, for five years we traveled here and each time we left empty handed and now to finally win it, it’s just a great feeling,” Howe said. Howe praised his team’s balance. “We’ve got a great lineup, great pitching, we play great defense, and all three of those are key in being a great team,” he said. He said. Despite the loss, Oskin still looks forward to playing in the same tournament again next year. Rob Mojarrdo had an RBI-single in the bottom of the second that drove in Armando Alcantar with the Angels’ lone run. “We’ll definitely be back next year, we always have a lot of fun playing here,” he said.